The cost of cleaning up a leak from an underground oil tank ranges from thousands to hundreds of thousands of dollars depending on how much contamination has occurred — and the worst part is, there’s a good chance your homeowner’s insurance won’t cover any of the costs. For areas such as New England, oil heat is very popular. In fact, in Maine, New Hampshire and Connecticut, oil is the most popular source of heat — heating 65% of homes in Maine, 46% of homes in New Hampshire and 44% of homes in Connecticut. Of course, not all homes with oil heat have underground tanks — some have above ground tanks outside or in the basement. All fuel tanks can leak and cause expensive damage, but those located underground are much more likely to result in contamination because they’re underground and out of sight. Those who own older homes that have since converted from oil to another form of heat are also at risk, as many homeowners abandoned their buried oil tanks when the heating source was changed or they transition to above ground, without proper drainage and disposal. We’ve gathered some insight to help you determine if you have an underground oil tank and learn the liabilities of having one, as well as the steps you can take to minimize the potential problems with your underground oil tank and how to remove it in exchange for a safer, above ground tank. Out of sight and out of mind is dangerous when it comes to underground oil tanks. 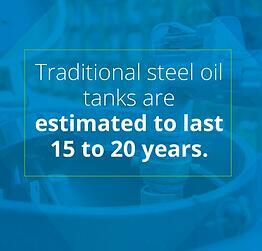 Traditional steel oil tanks are estimated to last 15 to 20 years, but the overwhelming majority of oil tanks have been in place longer than that. In addition to the tanks themselves, there’s the network of pipes and connections leading from the tank to your home that is also susceptible to leaks — regardless of their age. It’s easy to think that underground oil tank problems are only an issue for those that currently use oil as a heating source, but unfortunately, that’s not the case. Just because your home has converted to natural gas heat doesn’t mean that you’re risk-free, because there could be a buried oil tank somewhere in your yard. Hopefully, the tank has been properly decommissioned. If it hasn’t been, it’s considered "abandoned." An abandoned tank means while you may not be using oil as your heat source, you may still have a buried tank and pipes full of oil on your property — if you do, you’re susceptible to the risks that come with having oil heat. 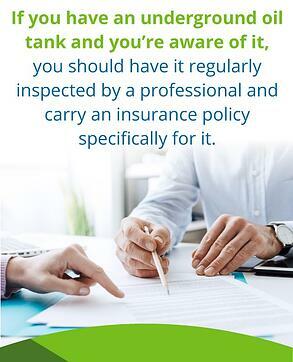 If you have an underground oil tank and you’re aware of it, you should have it regularly inspected by a professional and carry an insurance policy specifically for it. Even taking these steps doesn’t protect you completely from a leak. So, what happens if your tank does leak? If you have an underground oil tank, your risk of having an oil leak is high — and whether you have one now, or end up having one later, the cost of cleaning up contaminated soil and water sources ranges from thousands to hundreds of thousands of dollars. You may end up having to have a significant part of your property excavated to remove and replace the soil, in addition to cleaning up affected water sources. In addition to the cost of cleanup, you also must repair or replace your tank. Homeowners insurance rarely covers these costs — if you look, you’ll probably discover your policy has a disclaimer for underground oil tanks. Some states offer funds to help with the expenses of cleaning up the oil, but the claims outnumber the amount of money available, so your insurance may only cover a fraction of your fees. The high concentration of oil vapors that may come with your oil leak can be hazardous to your health. Short-term effects include disorientation, nausea, dizziness, drowsiness, headaches and more. The long-term effects to your health as a result of prolonged exposure can be significantly worse. If you can smell the oil, you should evacuate the area to avoid health-related problems. In addition to the cost of cleaning up an oil leak and repairing or replacing your underground oil tank, you could face potential lawsuits from affected neighbors. For example, if your oil leak contaminates a well nearby, you could face a lawsuit to cover the costs. Utility companies and government agencies have also been known to file lawsuits if they’re located nearby and have their property affected by your oil leak. If you have an underground oil tank, you face a few challenges when it comes to property value. First, those interested in purchasing your property are going to want documentation proving the underground oil tank hasn't contaminated your property. If you’re unable to show documentation, prospective buyers will probably assume there is some level of contamination, decreasing your property value. Unfortunately, even if you have someone willing to purchase the property with the underground oil tank, they may be unable to buy it as many banks will not offer mortgages for properties that have an underground oil tank. Costs aside, the effect of an oil leak on the environment can be devastating. A slow leak that occurs over time can spread with ease from the soil into ground water — and from ground water into surface water. The ground water may become unusable for irrigation, which can be devastating to many, especially nearby farmers. Left go long enough, and a leak may contaminate surface water, which can impact public health and wildlife. With these factors in mind, it’s essential to assess your risk of an oil leak. Has your home had oil heat since you bought it? How many years ago did you purchase the property? Do you have documentation that a previous owner replaced or repaired the tank? If answering these questions gets you to the conclusion that your tank has been in place for at least 15 years, the chances of it leaking now, or soon is high. Why? Because over time, the steel tank is exposed to moisture in the ground and it begins to rust and corrode. While this is a slow process, the longer the oil tank is in the ground, the more significant the corrosion will become. Eventually, holes will begin to form. These holes continue to get bigger, causing more oil to leak out of the tank and into the surrounding soil, polluting the ground and potentially the foundation of your home and nearby wells and water sources. If you have limited knowledge about your home’s history, you can learn when it was built, which can provide insight into whether it may have had an underground oil tank. How Do I Know If My House Has an Abandoned, Buried Oil Tank? First, look around the location of your furnace inside your home. Are there any old and small copper pipes that have been pinched off? If so, that’s a sign that your home probably used to have oil heat, which means you may have an underground oil tank on your property. Next, go outside and scan about a twelve-foot radius of your house and look for an oil tank fill valve or pipe. This hardware was used to fill the tank with oil, so it’s safe to assume if you find it, the oil tank is directly underneath it. Pipes may stand above the ground a few inches, but may also remain flush with the landscape. Brush can cover them, which makes them tough to find at times. If you see a valve or pipe in your yard, in addition to your gas meter, there’s a chance you have an abandoned underground oil tank. When decommissioned these valves are usually removed, leaving no signs of the old oil tank. Finally, take a walk around the house and look for a vent pipe. It should stand somewhere between six and twelve inches above the ground. Usually, it’s one to two inches wide and has a mushroom shaped cap on the top of it. It used to provide ventilation as the oil traveled from the underground tank to your home. Should you find evidence that an abandoned underground oil tank is on your property, you’ll want to have it decommissioned to protect your home, as well as the surrounding area. What Can I Do to Prevent Underground Oil Tank Problems? One of the biggest challenges to making sure your underground oil tank is leak-free is that you can’t see it. That makes everything more difficult. A licensed environmental professional can do a few different tests to the soil and water surrounding the tank to make sure there isn’t oil present. The documentation they provide can then serve as proof that your underground oil tank is not leaking. If the licensed environmental professional determines a crack exists, they can give you an estimate on what it would cost to repair or remove the tank. While most homeowner’s insurance policies exclude coverage for contamination to your home, property and surrounding areas by an oil tank, you may be able to add oil remediation coverage to your policy. Coverage amounts and policy costs will vary, but if you have an underground oil tank and no insurance to cover it, contact your homeowner’s insurance company to ask them if they offer oil remediation coverage. If your insurance company doesn’t offer it, look around for other insurance providers that do. Keep in mind that to qualify for oil remediation coverage, you’ll need proof that your underground oil tank complies with state and federal regulations. Federal regulations apply to larger tanks, but even if your underground oil tank is excluded from federal regulations, your state may have laws that require action on your part. You can find a list of underground storage tank contacts for every state on the Environmental Protection Agency’s (EPA) website. The only way to eliminate the hazards that come with an underground oil tank is to remove the tank from your property. If you discover you have an abandoned tank on your property, it’s best to get rid of it. For those that use oil heat, this means replacing it with an above ground tank. While above ground oil tanks come with many of the same risks, the fact that they’re protected from the moisture in the soil helps slow down rust and corrosion. Plus, above ground tanks are easier for you and a professional to inspect, so you can monitor the condition of the tank and catch any problems early, minimizing your risk. With the removal of your underground oil tank, and documentation proving that your property is clean, you can have peace of mind that you’ve eliminated any chance of costs, lawsuits or environmental issues from an oil leak. Regardless of what you decide to do with your underground oil tank — keep it or trade it in for an above ground tank — Smart Touch Energy can provide you with heating oil for up to $0.40 below the EIA's average pricing. We serve customers in New Hampshire, New Jersey, Delaware, New York, Connecticut, Maryland, Rhode Island, Maine, Pennsylvania and Massachusetts. On our website, it’s easy to shop for rates and purchase heating oil on our website — anytime, 24 hours per day, seven days per week. You can even start right now, by checking the prices at your location.